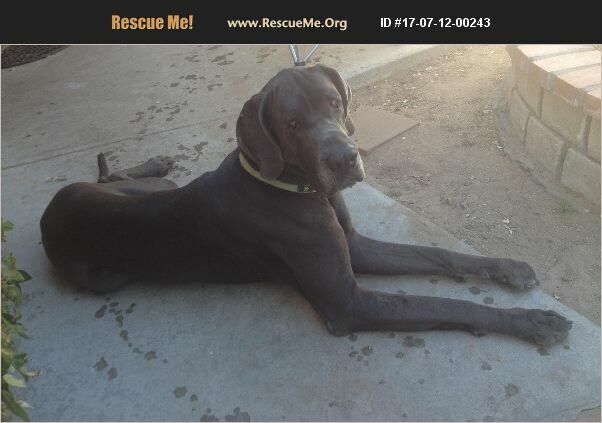 California Great Dane Rescue View other Great Danes for adoption. Meet our gorgeous 2 1/2 year old Euro Blue male Rebel! He is neutered, utd on all vaccines including rabies and bordatella, microchipped, house trained, crate trained, knows basic commands (sit, shake, still working on stay), he hugs on command and also does a gentlemans hug where he will hug you from a sitting position wrapping his arms around your waist and head on your chest. He is great with cats (grew up in a home with three cats) great with other dogs (he would frequent the dog park with his prior owners and has been great with every dog in rescue) . He ADORES children, and is very attentive to everyone he meets (the more hands to pet him the better) .. His ONLY fear is the scale at the vets office! He literally will turn into a blob on the floor and will need to be carried with all your strength to plop him into one (he is 136 pounds!) he was surrendered by his owners because they were forced to move into a much smaller space with no yard and knew it was NOT fair to him ... And on top Of that his owners were an elderly couple and he was becoming much to strong for them and simple walks were becoming a task they could barley complete... We have been working on leash training (he still pulls a bit, an does not realize his own strength.. So continued leash training is a must!) his fee is 900.. It covers his vetting (neuter, vaccines, pain Meds, microchip) as well as an ear flush we had done on him and the cost of removal of a fox tail he has embedded down one of his ear canals.. Plus his overall care (we have him on a grain free diet, daily vitamins ) come meet our handsome boy today and be prepared to fall madly In love!! !